We mentioned earlier that Ace Kvale is in charge of our new Zanskar Chadar Trek. Ace is one of the world’s top adventure photographers whose work has appeared in dozens of books, magazines and movies around the globe. While Ace’s photography put him on the map, it is his penchant for wild adventure that sets him apart from everybody else. Dangling from helicopters, climbing huge mountains and skiing first descents, places him in ideal positions to capture stunning photos. Additionally, having traveled to more than sixty different countries, including 25 expeditions to the Himalayas alone, it’s not cliché to say that, “Ace Kvale has seen it all.” He really has. It’s worth taking time out of your day to visit Ace’s online photo gallery. You’ll find images of Alaska, the Himalayas, the Alps and more. Ace shoots the type of images that belong in National Geographic. In fact, Ace Kvale shoots images FOR National Geographic. Exotic places and vanishing cultures are his domain. We recommend viewing them all. Pay special attention to the images labled “Zanskar.” That’s where we’re going in mid January. We’d also like to add that Ace will present every Zanskar attendee a signed commemorative work from the trip. Given Ace’s stature in the world of photography, this is a really special gift. If you love photography and wild places, then the Zanskar Chadar Trek is a once-in-a lifetime opportunity. 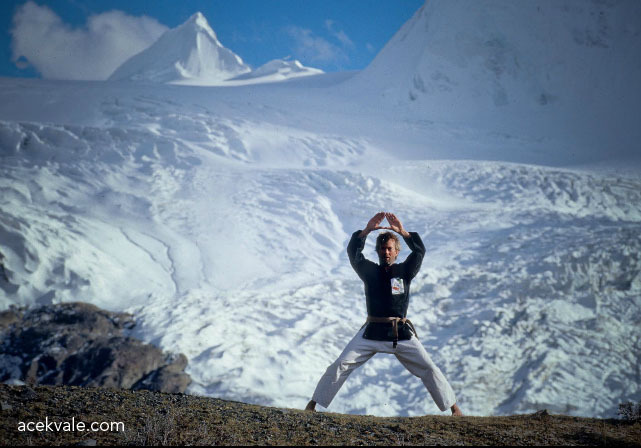 Ace Kvale striking a pose for his Sensai, Tibet. 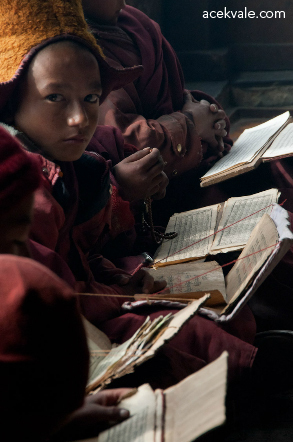 Young monk, Lingshed, Zanskar, India. raveling is not just seeing the new; it is also leaving behind. Not just opening doors; also closing them behind you, never to return. But the place you have left forever is always there for you to see whenever you shut your eyes.